(Above: Jellyfish Lake. See a video here). Participants in the annual New York City Triathlon got a rather nasty surprise this past Sunday. 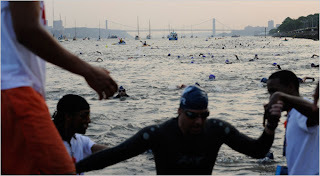 The swimming portion of the competition required taking a long dip in the Hudson River. (Side note: Ewwwwww.) When they plunged into the refreshing (slightly smelly) waters, the athletes were surprised to discover that they weren't alone. The river was filled with thousands upon thousands of jellyfish. Yes. This is HIGHLY unusual. In fact, I'd never even HEARD of jellyfish in New York Harbor until a visiting friend (hi Lili) told me that she'd spotted a number of the beasts floating near the piers at South Street Seaport. Unfortunately, they all disappeared by the time I got down there to take a look. Now, authorities are wondering if the jellyfish may have played a role in the tragic death of one of the triathletes--a thirty-two-year-old Argentinean man who had to be pulled from the water. Scientists say it's unlikely. 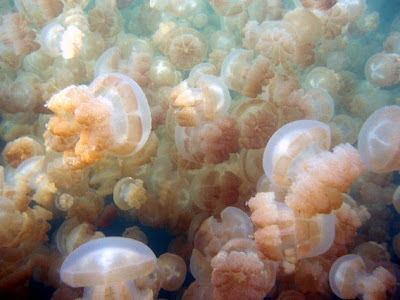 The two most common kinds of jellyfish in New York waters are moon jellies and lions mane jellyfish. Both can cause a nasty sting, but neither is known to be deadly. But I have a feeling that if I were to unsuspectingly jump into a river filled with jellyfish, I might need to be rescued, too. Couldn't someone have given them a heads up? Read more here, here and here. New York is so cool. I'll always love it, no matter what. If only there was a gigantic chicken to bawk a warning to them so they would be distracted temporarly and then notice the jellyfish. i hate jellyfish with a passion. thank heavens i wasn't planning on going swimming in the ny harbor (whose idea was that?) anytime soon. Somebody planned it. Check the guys backround, the venom in the blood. It's like man it is obvios that somebody put all of the misunderstood Jellyfish there to create a diversion! I would be all over the case! There is a Kiki Strike Irregular Camp in Austin, TX for 10 to 14 y.o. What!? I saw tons of them when I took the water taxi to ikea the other night....lost count at 30! "It feels like rubber in your mouth and it tastes like what ever you flavor it!" Perhaps that guy had some weird allergic reaction to jellyfish. 0.o Or maybe they paralyzed him and he drowned. Either way... ouch. Ther is SOMETHING alive in the HUDSON??? Sorry didn't know it was clean enough to sustain life. Hello! Yeah, I saw quite a few. That's really sad for the people who got shocked. WHY didn't they know? So stupid. Also, I've never even heard of non-stinging jellyfish. That's really cool. oh gosh, someone i know went 2 new york and saw the jelly fish... her cousin stepped on severalin a row... ouch! Good Luck to the Austin Irregulars!